Cancer cells are distinct from normal body cells based partly on their unique metabolic status, one element of which is an unusual requirement for fatty acid synthesis. Fatty acids are the major constituents of membrane lipid. Cellular proliferation requires fatty acids for synthesis of membranes and signaling molecules. Thus rapidly- proliferating cancer cells often have a robust program of fatty acid synthesis accompanied by high-level expression of associated genes such as fatty-acid synthase (FASN). FASN is over-expressed in many cancers. Increased lipid biosynthesis and desaturation are key requirements for tumor cell survival and proliferation. Fatty acids are chains of carbons with attached hydrogen molecules at one end and an acid group (carboxylic acids) at the other end. Long-chain fatty acids are types of fats that have several carbons in their chain and include unsaturated and saturated fats. 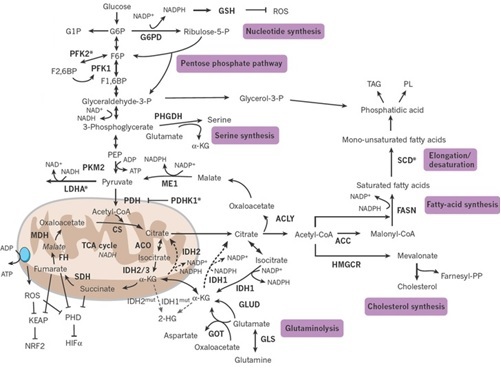 Long-chain fatty acids are critical for the rapid membrane synthesis requirement in vigorously-growing cells and play key roles in various signaling schemes. Additionally, a suitable balance of chain-lengths and degree of saturation is critical for maintenance of membrane fluidity and curvature. The lipid composition of cellular membranes is regulated to maintain membrane fluidity. A key enzyme involved in this process is the membrane-bound stearoyl-CoA desaturase (SCD) which is the rate-limiting enzyme in the cellular synthesis of monounsaturated fatty acids from saturated fatty acids.Saturated fatty acids and monounsaturated fatty acids are among the most abundunt fatty acids in mammalian organisms. These fatty acids are fundamental components of structural, energetic, and signaling lipids; hence their levels have to be tightly regulated by the cell. A proper ratio of saturated to monounsaturated fatty acids contributes to membrane fluidity. Alterations in this ratio have been implicated in various disease states including cardiovascular disease, obesity, non-insulin-dependent diabetes, hypertension, neurological diseases, immune disorders, and cancer. SCD is an important metabolic control point in the fatty acid synthesis pathway that is essential for cancer cell viability. Cancer cells are sensitive to loss SCD function. The regulation of SCD is therefore of considerable physiological importance and its activity is sensitive to dietary changes, hormonal imbalance, developmental processes, temperature changes, metals, alcohol, peroxisomal proliferators, and phenolic compounds. To date, two SCD isoforms, SCD1 and SCD5 have been identified in human. SCD1 occurs at elevated levels in obese people and increased SCD1 expression has been detected in malignant human tissues. It has been reported that inhibition of various steps in the fatty-acid synthesis pathway causes inhibition of cancer cell growth and strong induction of cancer cell apoptosis, either because of deficiency in downstream fatty acids per se, or bencause of buildup of toxic pathway intermediates such as malonyl-CoA, or both. Altogether, these results suggest that desaturated fatty acids are required for tumor cell survival and that SCD represents a viable target for natural cancer therapy. Biochemical and physiological function of stearoyl-CoA desaturase. Regulation of stearoyl-CoA desaturases and role in metabolism. Stearoyl-CoA desaturase-1: a novel key player in the mechanisms of cell proliferation, programmed cell death and transformation to cancer. Cancer cell dependence on unsaturated fatty acids implicates stearoyl-CoA desaturase as a target for cancer therapy. Human breast cancer tissues contain abundant phosphatidylcholine(36∶1) with high stearoyl-CoA desaturase-1 expression. Plasma fatty acid composition in patients with pancreatic cancer: correlations to clinical parameters. SCD1 inhibition causes cancer cell death by depleting mono-unsaturated fatty acids. Inhibition of stearoylCoA desaturase activity blocks cell cycle progression and induces programmed cell death in lung cancer cells. Abrogation of de novo lipogenesis by stearoyl-CoA desaturase 1 inhibition interferes with oncogenic signaling and blocks prostate cancer progression in mice. Inhibition of stearoyl-CoA desaturase 1 expression induces CHOP-dependent cell death in human cancer cells. Unlike saturated and monounsaturated fatty acid, polyunsaturated fatty acids (PUFA) cannot be synthesized in the body and must be obtained from the diet. There are two major classes of PUFA: n-6 (omega-6) and n-3 (omea-3). The n-6 and n-3 PUFA also cannot be interconverted in the body, but within each series, their metabolism can produce various lipids that differ in chain length and number of double bonds. n-3 PUFA refers to a group of three fats called α-linolenic acid (ALA) found in plant oils, eicosapentaenoic acid (EPA) and docosahexaenoic acid (DHA) both commonly found in marine oils. n-3 PUFA also inhibits SCD1 and influences cell membrane conformation and signaling dynamics. However, most people are consuming far too many n-6 (omega-6) PUFA compared to n-3 (omega-3) PUFA. Total fat intake and the ratio of n-6/n-3 PUFA have increased significantly. Increased fat consumption has been associated with the development of chronic inflammation and specific types of cancer such as breast, colon, pancreatic and prostate cancers, with the notable exception of n-3 PUFA, which show protective effects against colon, breast, pancreatic and prostate cancers in a number of experimental systems. α-linolenic acid (ALA) is found in plant oils (e.g. chia seed, flaxseed, walnuts)- yet chia seed contains the highest amount of ALA per serving than any other source. Chia seeds are not only packed with ALA, but can also easily be considered one of the most versatile of all superfoods out there. Not to be confused with gamma-linolenic acid (GLA). GLA is in the omega-6 family that is found mostly in oil rich plants. %ALA below mentioned is for the oil extracted from each item. Are all n-3 polyunsaturated fatty acids created equal? Associations between plasma polyunsaturated fatty acids, plasma stearoyl-CoA desaturase indices and body fat. Regulation of stearoyl-CoA desaturase by polyunsaturated fatty acids and cholesterol. Dietary cholesterol opposes PUFA-mediated repression of the stearoyl-CoA desaturase-1 gene by SREBP-1 independent mechanism. Lipid redistribution by α-linolenic acid-rich chia seed inhibits stearoyl-CoA desaturase-1 and induces cardiac and hepatic protection in diet-induced obese rats. Walnut oil increases cholesterol efflux through inhibition of stearoyl CoA desaturase 1 in THP-1 macrophage-derived foam cells. There is also some evidence that specific plant lipids and phytosterols can influence membrane fluidity and lipid composition. Sterculic oil is extracted from seeds of the Sterculia foetida tree, also known as the wild almond tree. Sterculic oil is said to aid in the treatment of diabetes, heart disease, high cholesterol, insulin resistance and metabolic syndrome. In addition, sterculic oil is purported to reduce abdominal fat. Sterculic oil contains cyclopropenoic fatty acid, a type of fatty acid that appears to inhibit SCD1. SCD1 also plays a key role in modulating the effects of saturated fatty acids (stearate and palmitate); these fatty acids have a strong lipotoxic potential to induce inflammation, endoplasmic reticulum stress, and insulin resistance in distinct cell types. A recent study showed that mice given sterculic oil for nine weeks had a decrease in liver inflammation and an improvement in insulin tolerance (a key marker of metabolic health). Sterculic Oil, a Natural SCD1 Inhibitor, Improves Glucose Tolerance in Obese ob/ob Mice. Stearoyl CoA desaturase 1: role in cellular inflammation and stress. Stearoyl-coenzyme A desaturase 1 inhibition and the metabolic syndrome: considerations for future drug discovery. Lipido-sterolic extract of Serenoa repens (LSESr, Permixon) treatment affects human prostate cancer cell membrane organization. β-Sitosterol is one of several plant sterols with chemical structures similar to that of cholesterol. β-Sitosterol has been shown to alter cell membrane structure, fluidity, and cell signaling. 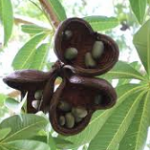 β-Sitosterol strongly inhibits the growth of cancer cells and induces apoptosis in cancer cells. Sinnolzym contains Sterculic oil, β-Sitosterol, Cerulin and Zorvan. Sinnolzym was developed based on its ability to inhibit lipogenesis through inhibition of FASN and SCD1 in cancer cells. Plant sterols as anticancer nutrients: evidence for their role in breast cancer. Studies on β-sitosterol and ceramide-induced alterations in the properties of cholesterol/sphingomyelin/ganglioside monolayers. The effect of β-sitosterol on the properties of cholesterol/phosphatidylcholine/ganglioside monolayers-The impact of monolayer fluidity.